This is my newest painting that I hope to finish today. I will catch up this evening. Have a great day! My completed painting for auction: from start to finish in two hours. Some people brought work that was already half complete or started working on it early in the morning. I wanted to challenge myself, especially using oils, to see if I could do it, so I waited. And I was satisfied with the result. The oils were a total mess to use though. I came home with paint on me, my clothes, my easel, my car, everywhere. 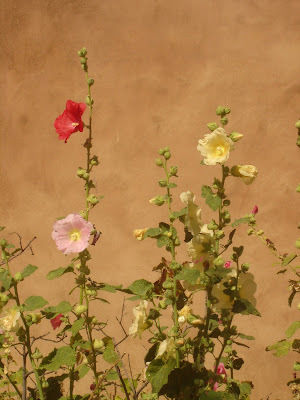 The most beautiful simple hollyhocks by the side of a house near Kit Carson park. I was just driving down the road and they jumped into my line of vision, so I had to turn around, go back, and take a few photos.This will definitely become a large painting. I love the three colors; pink, yellow, and red. This was taken while I was driving; Taos at its most beautiful. The colors are just starting to change. I wish I had had more time, but this will also become a larger piece. I had fun but am very tired, driving six hours is hard on the brain. I'll post more photos tomorrow. Good night! 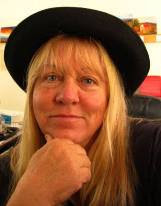 I just wanted to check in and tell you what's going on in my "painting" life. Today I finished a larger version of the small painting I posted yesterday. I also underpainted a 24x30 fall bouquet on a red background. I finished two other pieces, I think they're probably 8x16. I'm ashamed to say that I didn't even notice the size! I was going through photos and found two that inspired me, so I just grabbed the canvases and started painting. 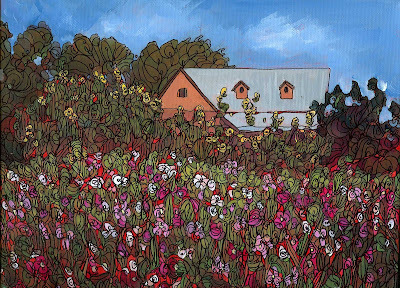 One is a purple window with hollyhocks (I've painted this for other shows, it's pretty popular). The other is a sunset with mountains and rolling hills. 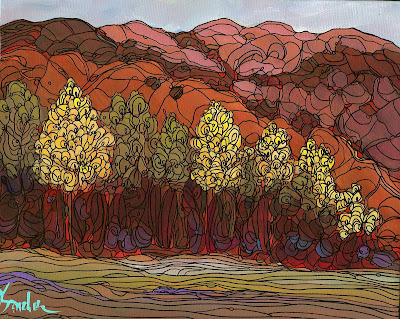 I will outline those tomorrow, finish the red bouquet, and FINALLY start those aspens. I think I'm putting that one off because of the outlining involved. My husband keeps asking, "Haven't you started those aspens yet?" 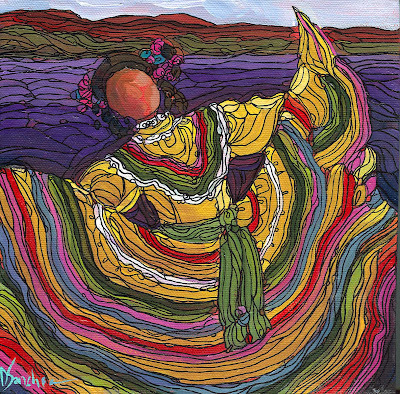 Tomorrow I will also get everything ready for my day trip to Taos on Sunday to paint in the Taos Center for the Arts QUICK DRAW fundraiser. I'm debating on whether to take oils or acrylics. The painting has to be ready in two hours, so no outlining will be involved. I'm thinkin' oils. 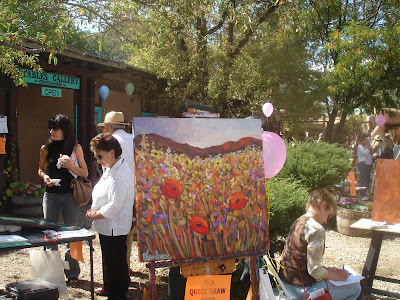 I'll just paint a very colorful wild mass of New Mexico flowers. That should be fun. Painting with 44 other artists, all of us in the same location, should be a blast. I'l try to get some video. Anyway, if you don't hear from me for a day or so, just remember, I'm working hard and I'll post as soon as I can. Love you guys and thanks for being so supportive. Click on the link below for purchase information. 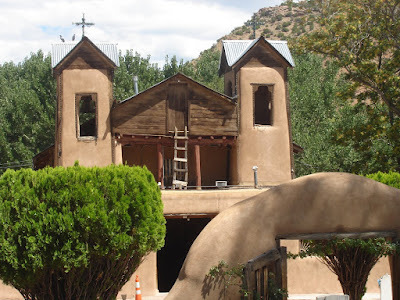 I couldn't resist - I came across a photo of this little adobe taken in Taos last fall. 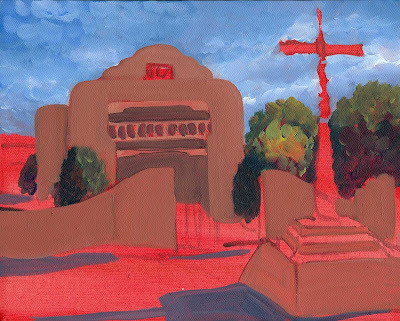 I'm painting a larger image of it, so I thought I'd paint a smaller version for you. It's hard to create daily paintings when your mind is on painting for a big show, but I couldn't resist, it's so cute. I will post a photo of the larger piece when it's complete - probably a 12"x16." This painting should be finished tomorrow. I took the photo late at night in the studio so I will post a finished better quality photo tomorrow. I still haven't painted my aspens yet! 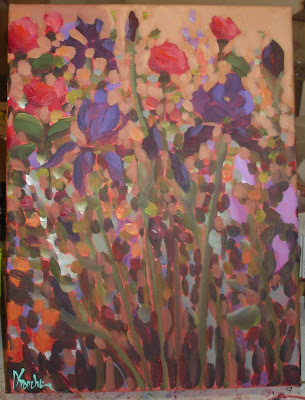 I'm also working on a big bouquet on a red background. I'm trying to get all of my largest pieces finished by October 5 and the rest of the month will be nothing but smaller paintings. I have Taos this weekend and Balloon Fiesta next weekend. Already! I will find out about my balloon painting giclees next week. Hello - just a quick photo of the painting I'm working on. It's 16"x12" and iris in a mass of wildflowers. I'm hoping to finish today. I'll write more later. 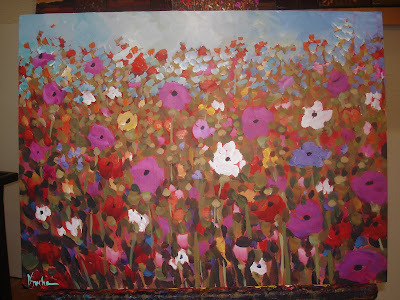 A wild mass of poppies - one of my favorite subjects to paint. 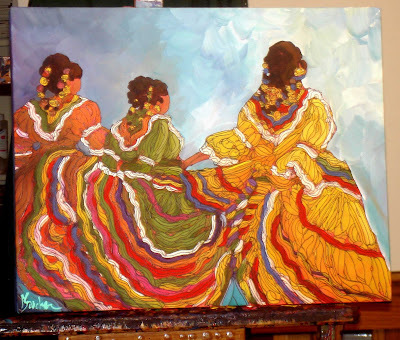 I am finishing this piece today then I will start a 24x30 aspen and a 24x36 Sandia Sunset. I am in the zone! I hope to do a small video of my starting process and the ongoing progress of one of the paintings. Stay tuned! "HARVEST BEFORE THE STORM, CORRALES"
Good morning I snapped this photo last night and the lighting was not the greatest. I am in the outlining stage now and hope to finish today. I'm loving it so far! The painting has a nice fall feel to it - lots of flowers, but it's like their last "hurrah" bloom of the summer before the cool weather arrives. Now that I'm almost done with my first larger piece for the show, I'm itching to paint another one. 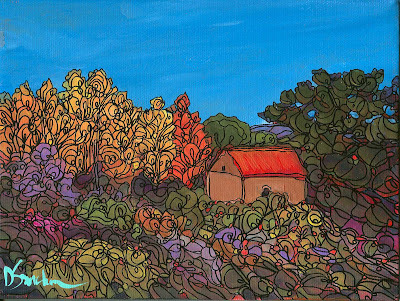 I may start a 36x24 aspen painting next. Enjoy your day! This photo was taken by a friend and I loved it. The perfect little New Mexico house surrounded by the "last of summer" flowers. The outlining took FOREVER on this small painting! I should have a new one for you tonight. Have a great day! 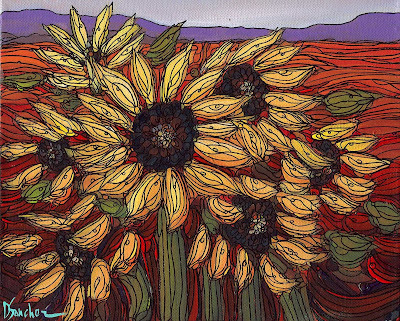 When I started my art career, sunflowers became my signature. I painted so many that I got a little tired of them. Now, when I get ready for a show, I want to paint sunflowers. Maybe it's because I don't paint that many anymore. 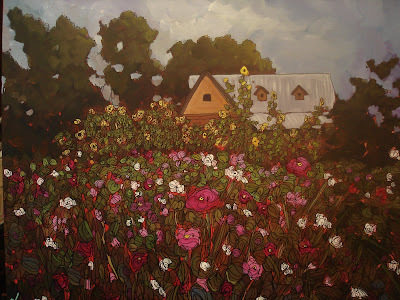 This painting is out of my head, but I have a lot of new photos of a sunflower field by the river that I'm really excited about painting. I have many other subjects but I always seem to come back to these beautiful, proud flowers. 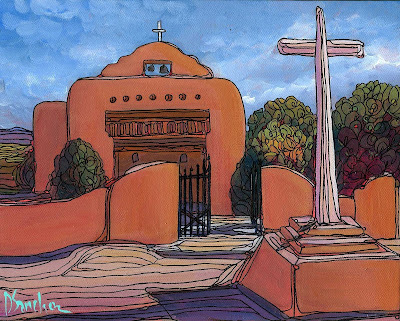 This painting gets its inspiration from a photo on my recent trip to Chimayo. I'm not even sure exactly where we were but we came upon this little church with a side courtyard and these beautiful crosses. 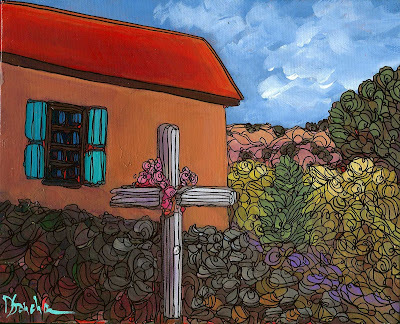 There were more crosses on the ground but I left them out because they didn't really fit the composition I wanted. I am almost finished with this size canvas (unless I buy more!) and will be moving on to a larger size, hopefully today. I hope you all have a wonderful week. You kow where I'll be! 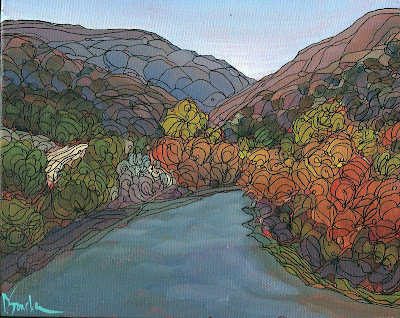 This painting will be featured at my show in November. I took a wonderful photo a few years ago and I paint a rendition of it for almost every show that I have. 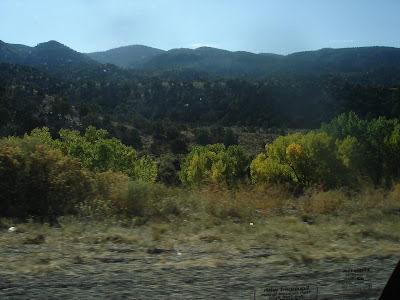 I love the orangy-red hills and the fall colors of the aspens. 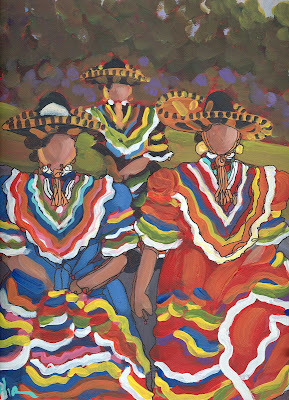 I am finishing up all of my 8x10s and tomorrow I hope to start work on my 30x30 Taos with flowers. 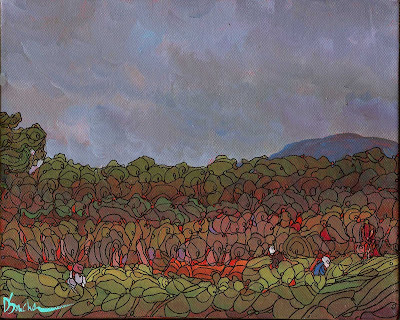 This painting is the first in my series of "Wilds" for Artfest. It is a wild and crazy field of yellow coneflowers, possibly stretching and reaching for the sun. I'm headed to work out and then it's back in the studio. 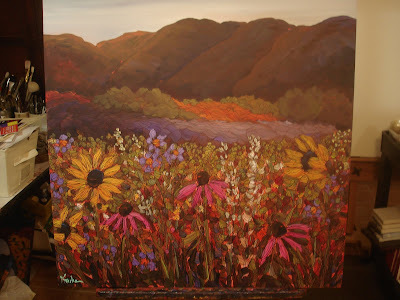 Today I will be starting a new painting - a 30x30 Taos Mountain with sunflowers and wildflowers in the forgeound. I will post the progress tonight. Enjoy your day! 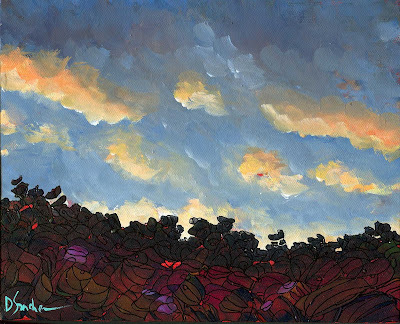 This is a small painting of the back of the Sandia Mountains. I am trying to work on Artfest paintings in this order: one medium, a few smalls, one large, a couple of ornaments, a few smalls, etc. Hopefully, that will keep it fresh for me. I have so many ideas I want to paint and I know there won't be enough time. There never is! But truthfully, some of the best work usually comes in the last days before the show. Knock on wood! If you fall in love with a particular painting, please email me for purchase information. 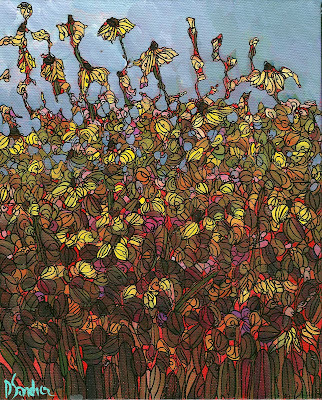 Tomorrow: what I like to call the "wilds", those crazy masses of flowers. First one of many for Artfest. I just felt like painting a wild mass of flowers. I shot this with my digital because it's too large for my scanner, so the quality is not perfect. I just wanted to give you an view of what I've been working on. 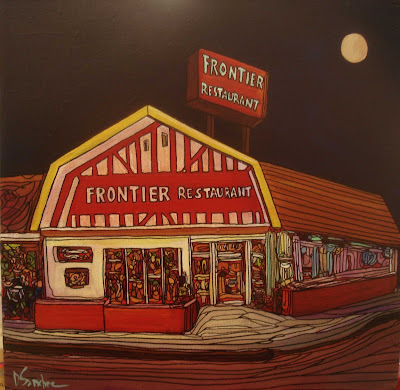 The famous Frontier Restaurant, the open-all-night hang out for all of the Uiversity of New Mexico kids, as well as all of the rest of us. The best breakfast burritos and cinnamon rolls - to die for. The restaurant is owned by art patrons, so art is ALL over the walls. It's great. I had a craving to get back to landscapes today! 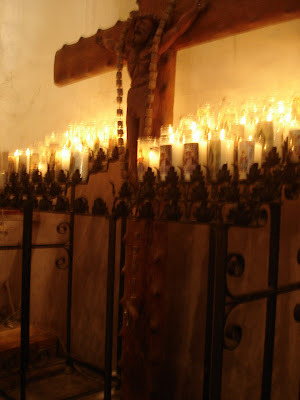 This is from a photo I took in the evening at an event in the little village of Algodones. 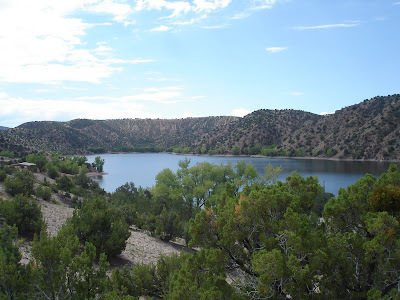 It sits about fifteen minutes away from Albuquerque on the way to Santa Fe. I couldn't do the photo justice but I love the colors and I love playing with skies. Hope you enjoy. Please see the Paypal link below for purchase information. 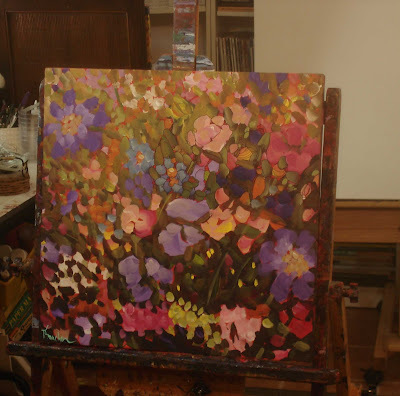 I'm starting my first Artfest painting today - it's a 20"x20" massed bouquet of flowers; full of different shades of purples and creamy yellows. I will post progress and commentary on these works that I'll be doing as it helps me to see the progress too! This is my happy dancer. I don't think she has a care in the world, she's just enjoying the music and having a good time. 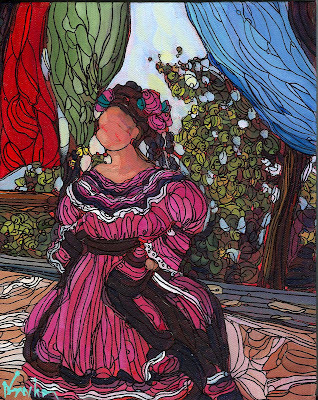 I am working on a commission for the Frontier Restaurant today then it's on to Artfest paintings. 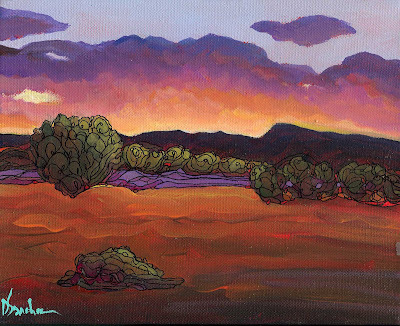 Oh, and I have a new daily painting "SUNSET AT ALGODONES" that will be posted as soon as it dries. I just felt like painting clouds! Enjoy your weekend. I saw five beautiful balloons over my house this morning - Balloon Fiesta is almost here! 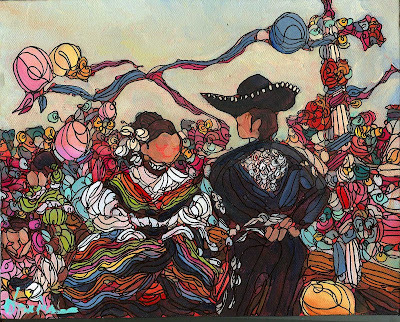 My next painting in the series of folklorico dancers. Ths actual photo was a little washed out with lots of distractions, including a cinder block wall as a background, even though the float was rolling along the street. When I finished it, I felt like something was missing but didn't knwo what. I finally realized that the original sky color was a very pale blue, almost white. Iy needed warming up, so it got a nice warm orange glaze. Now I love it. 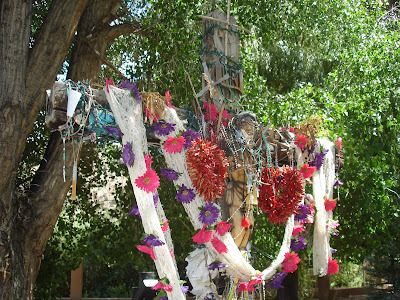 A shrine with crosses, rosaries, a strand of red chiles, and a shawl with flowers. My day trip was so relaxing and fun! I took about 160 pictures and I'm bummed because I forgot to take a video. But oh well - another day trip in October when the leaves are turning. I haven't been to the church for about 9 years and it has changed. 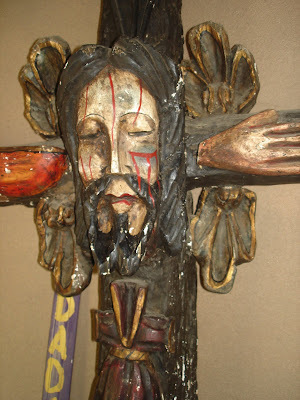 They have a big new parking area, new upgrades, a new chain link fence that was filled with handmade wooden twig crosses, and new outside seating and stations of the cross. We went inside the church, lit candles, said prayers, and scooped healing dirt from the hole in the floor. It was a good day. I told myself I was going to finish this yesterday but I took Labor Day seriously and did absolutely no labor! 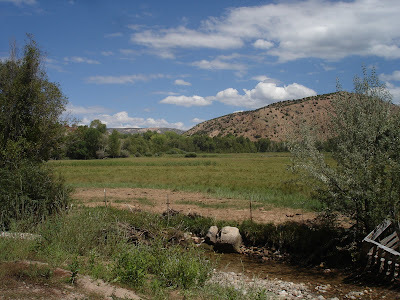 Today I am headed to Chimayo for a lovely day trip, so that leaves me tonight and part of tomorrow. I am shipping this out on Thursday/Friday so it better be finished! Thurday starts my "WEEMS ARTFEST" deadline countdown. I have lots of canvas, lots of ideas. Now if I can just bring what's in my head to life on the canvas. I'm looking forward to a really exciting show this year. I'm trying to include some of my one-of-a-kind hand-painted ornaments. They take forever to paint but it's worth it. I may have 20-30 for the show. Anyway, enjoy your day! Hopefully I'll get home with great pics and video of Chimayo and surrounding areas.